A team of NASA scientists has captured amazing radar images of a huge, mile-wide asteroid as it drifted silently millions of miles from Earth — its closest approach to our planet for the next 200 years. Astronomers with NASA's Jet Propulsion Laboratory in Pasadena, Calif., used the agency's Deep Space Network antenna in Goldstone, Calif. to capture three new radar views of asteroid 2007 PA8 between Oct. 28 and 30. By the end of the cosmic photo session, the asteroid was about 5.6 million miles (9 million kilometers) from Earth. As of Monday (Nov. 5), the asteroidwas about 4 million miles (6.5 million km) from our planet. That is about 17 times the distance between the Earth and moon. "The radar images of asteroid 2007 PA8 indicate that it is an elongated, irregularly shaped object approximately one mile (1.6 km) wide, with ridges and perhaps craters," officials with NASA's Jet Propulsion Laboratory in Pasadena, Calif., wrote in an image description on Monday. "The data also indicate that 2007 PA8 rotates very slowly, roughly once every three to four days." As its name suggests, asteroid 2007 PA8 was discovered in 2007 by astronomers with the Lincoln Near Earth Asteroid Research project at the Massachusetts Institute of Technology's Lincoln Laboratory. Since then, scientists have continued to learn more about the near-Earth asteroid, NASA officials said. "The trajectory of asteroid 2007 PA8 is well understood," they wrote. "This flyby was the closest Earth approach by this asteroid for at least the next 200 years." 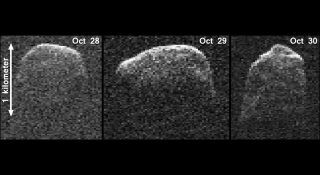 This isn't the first time NASA has used radar observations to capture new images of nearby asteroids. Just last year, on Nov. 8, 2011, the huge asteroid 2005 YU55 passed Earth well inside the orbit of the moon as astronomers and telescopes watched from around the world. The observation campaign captured unprecedented radar and optical images of the big asteroid, which was nearly 1,300 feet wide (400 meters). NASA scientists and astronomers around the world regularly track near-Earth asteroids and search for previously unknown space rocks with telescopes on Earth and in space. The work is aimed at determining if any asteroids pose an impact threat to our planet. NASA's Jet Propulsion Laboratory oversees the space agency's Near-Earth Object Program Office and includes the Asteroid Watch program, which serves as a public outreach effort. Today (Nov. 6), Asteroid Watch scientists said another space rock, the asteroid 2012 VD5, just zoomed by Earth just beyond the moon's orbit. Asteroid 2012 VD5 zipped by Earth at 5:38 a.m. EDT (1038 GMT) at a range of about 367,000 miles (591,000 km). That is about 1.54 times the Earth-moon distance. "For those asking, asteroid 2012 VD5 is very small (approx. 20 meters) & not naked-eye visible," Asteroid Watch scientist wrote in a Twitter update. "So small it's not classified as hazardous."